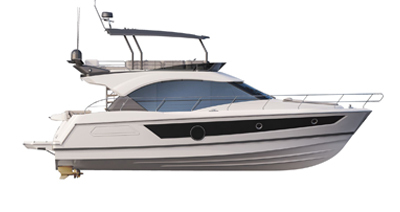 The style and line of the Flyer 8.8 SUNdeck are appealing, as is the layout which is remarkably comfortable for this size of boat. She remains a dayboat, but with colossal progress made in the interior, the high quality finishes and equipment mean that you can enjoy a wider range of programmes, even small cruises. With her side glazing, ‘Skyview’ deck hatch and ventilating portholes, the forward cabin offers two very comfortable berths. During the day this becomes a huge saloon seating eight people around the table. The incredibly generously spaced interior is equipped with a refrigerator, a microwave, a separate shower room with toilet and shower, and also has a stern mid cabin! The layout of the large forward sun loungers affords easy access to storage and anchoring. The rear seat converts into a sun lounger. By increasing the air inflow beneath the hull, the Air Step® 2 represents a considerable development of this technology that increases performance, safety and cruising comfort. While reducing fuel consumption, she accelerates faster and speed is augmented. This latest generation of a patent that has already proved its worth also offers excellent sea-keeping, simpler passage through the waves, linear acceleration and easily handled curves. The ‘air cushion’ effect aft of the hull procures amazing comfort. Developed in close partnership with Suzuki, the Flyer 8.8 is available with engine power delivering up to 500 HP. She has a 400 litre fuel tank (106 US GAL) with the option of up to 600 litres (158 US GAL). CE Certification B8 - D11 - maximum 11 passengers on board. Outdoor galley with sink and gas hob. Driving console with protective windshield, extremely comfortable leaning post. Two forward sun loungers easily access by large walkways. Single or double outboard engine - maximum power 500 HP - Holiday pack Suzuki engine. Saloon converts into king-size double berth, mid cabin can accommodate two people. Galley space with refrigerator, microwave and storage. Bathroom with toilet and shower. New saloon concept with three benches seating up to 10 people.